Susan is the founder and Director of Silver Lotus Training Institute. Formerly a professional classical ballet dancer, she received a Bachelor’s Degree from the Philadelphia Dance Academy (forerunner of the University of the Arts in Philadlephia). She taught ballet and modern dance at both the professional and college levels and has extensive study in labanotation, anatomy and physiology and applied kinesiology. She began studying yoga in 1972 and later was certified by White Lotus Foundation, and Phoenix Rising Yoga Therapy. She studied Iyengar, Kripalu and Viniyoga styles. She certified in Phoenix Rising Yoga Therapy and became a Mentor and Program Assistant with that organization. She earned a Masters of Arts Degree and later a Masters of Social Work degree and developed a Body/Mind based private clinical practice known as , The Women’s Mental Health and Wellness Center. Together with co-founder Carolyn Dozier, LCSW-C, in Silver Spring Maryland they offered a variety of healing practices including yoga, tai chi, acupuncture, massage and psychotherapy. In 1993 Susan founded Silver Lotus Training Institute and has trained over 100 yoga teachers since that time. She developed a system of teaching yoga, “Svadhyaya Yoga” which is a highly individualized and adaptive teaching method for teaching the yoga classics through safe, adaptive execution of classical yoga principles. The Institute was registered with the Yoga Alliance at both 200 and 500 hour levels. In 2014, Susan turned the Yoga teacher training program over to Svadhyaya Yoga graduates, Kate Fitzgerald and Barbara Spears of Involution Yoga Center in Lewes, Delaware. Since that time she has dedicated herself to the development of Tai Chi and Qigong programs for health. 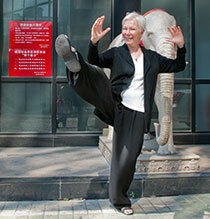 She began her serious study of Tai Chi in 2000 on a trip to China. Since that time, her primary teacher has been Dr. Paul Lam. She has also trained with Dr. Aihan Kuhn, Master Wing Cheung, Ken Cohen, Roger Janhke, Master Wiliam Ting and Al Huang. She has certified in several Tai Chi for Health Programs which were created by Dr. Paul Lam and is a Senior Trainer for the Tai Chi for Health Community. She also earned certification to teach Therapeutic Qigong and Shibashi I, II, III and IV. Additionally, Susan teaches Yang 24 forms, Yang 32 sword form, Sun 73 forms, Double Fan form (created by Dr. Kuhn) and various Tai Chi for Health forms that were developed by Dr. Paul Lam. Throughout her personal and professional practices, Susan is dedicated to individualizing healing techniques to fit the needs of those with whom she works. She teaches community classes, teacher training programs, tai chi to people with movement disorders and qigong to all levels of players. Marianne works closely with Susan Hamadock in creating and directing the programs of Silver Lotus Training Institute. In her day job she serves as the Science & Restoration Coordinator for the Delaware Center for the Inland Bays. Marianne began studying yoga in the early 1990's, while living in the Washington DC area. She became certified as a Svadhyaya Yoga™ teacher in 2001, moved to the Delaware shore shortly afterward, and has been teaching with Silver Lotus ever since. In 2005, Marianne became certified as an instructor through Dr. Lam's international Tai Chi Health Institute. Since then, she has trained intensively in Tai Chi for Health programs and now serves as a Master Trainer (MT) for the Institute. In this role, she assists the Institute with training of TCH instructors throughout the United States. 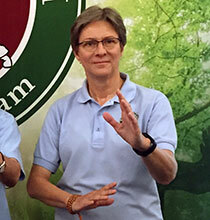 Marianne has also served as a Director and Vice President of the Tai Chi for Health Community (TCHC), a professional organization of U.S.-based Tai Chi instructors. In addition, she maintains the websites for both Silver Lotus and TCHC. Marianne's special interests include using Tai Chi, Qigong, and Yoga practices for stress reduction and in recovery from emotional and physical illnesses and injury. She has become known for her ability to adapt practices to fit the needs of almost anyone, regardless of fitness level, body type, illness or injury. She is certified to teach Dr. Paul Lam's Tai Chi for Arthritis and Fall Prevention, Seated Tai Chi, Tai Chi for Diabetes, Tai Chi for Rehabilitation, and Tai Chi for Energy programs. In addition, she has studied and teaches a variety of other Tai Chi and Qigong styles, including Sun 73 Forms, Yang 24 Forms, Yang 40 Forms, Yang 32 Sword Forms, 42 Combined Sword Forms, Shibashi Qigong, and several fan forms. In her free time, Marianne enjoys her cats, reading, photography and art, birding, native plant gardening, hiking and kayaking.